Last week I attended the opening the Toussaint L’Ouverture Library of New Toulouse . What an open, friendly, educational, magical place. Partygoers wore celebratory white and toasted with traveling cups of gin. I took in the accompanying exhibition about Kate Chopin and thought I’d illustrate for you here just what an exhibition in SL looks like. Here you see me examining a photograph, imported into the SL interface. I click on the photograph and a dialogue box containing a “webliography” appears so I might examine exhibition themes more deeply. 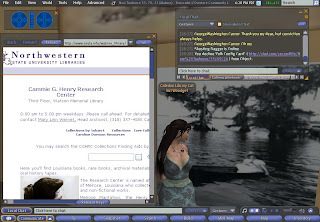 The web page opens within sl or can override the sl window altogether. 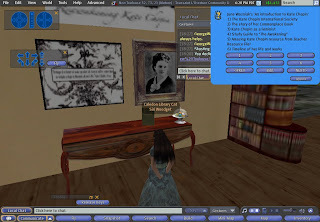 Opening the page in-world allows me to continue an easy rapport with other visitors – I can interact with them as well as the text. In other words, I can stand side by side with others and enjoy the exhibition – sipping gin of course.